Wabash promotes the opportunity for students to work side by side with faculty and conduct research. 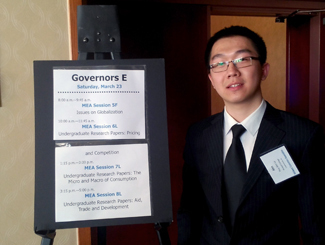 Students like Huy Anh (“Tommy”) Le ’13 also earn the honor of presenting their work at professional conferences. Le ’13 presented a paper Ma.23 titled “Urbanization and Economic Development in Vietnam: An Environmental Look (1986-2008) at the Midwest Economics Conference in Columbus, OH. Le plans to attend graduate school and pursue a doctorate post-graduation from Wabash.. Le also credited Professor Byun for her assistance in editing and motivating him during his research.